Brooklyn cosmetic and family dentist Dr. Alexander Khabensky’s gained the trust of his patients for his positive demeanor, excellent skills, and wonderful bedside manner. Dr. Alexander Khabensky’s patients consider him as caring, gentle, and a true master of his work. He enjoys all aspects of General Dentistry including endodontics, cosmetic dentistry, restorative dentistry, and laser dentistry. Dr. Alexander constantly stays on top of his craft with his continuing education classes. 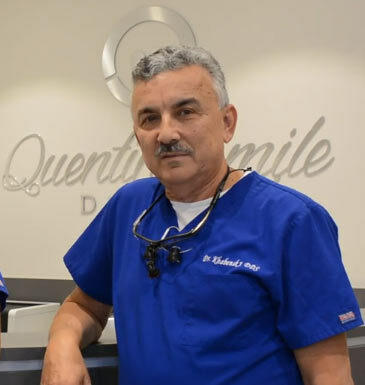 His knowledge and passion for the field paved the way for his son, Igor’s, own journey into the field of dentistry. Igor Khabensky DDS a top rated Brooklyn dentist himself is now a partner at Family Cosmetic & Implant Dentistry of Brooklyn. Besides cementing crowns and bridges, creating smiles, and restoring dental implants in his Brooklyn clinic, Dr. Alexander Khabensky is also an avid outdoorsman. He loves long walks with his companion Dasha, a miniature schnauzer, freshwater fishing along the Delaware River, and road trips to Pennsylvania.